A number of Manchester United fans are tweeting that Alexis Sanchez is finished after another anonymous performance in today’s game against Watford. The Chile international was a huge statement signing by United from rivals Arsenal back in January, but he was slow to settle in the second half of last season. 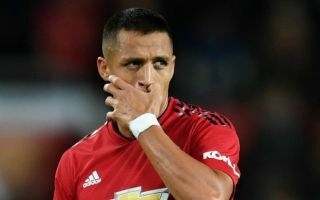 Jose Mourinho publicly defended the player at that time, saying he wasn’t keen on making signings like that in the middle of the season as Sanchez hadn’t had much time to settle in at Old Trafford. Still, despite a whole summer off due to Chile not making the World Cup, and with a full pre-season for his new club, Sanchez continues to struggle to replicate his best form in a Red Devils shirt. The 29-year-old has just three goals in 23 appearances for United, which is far from good enough for a player of his calibre, who looked one of the world’s best at previous clubs Arsenal and Barcelona. 3 goals in 23 appearances for Alexis at United now. Huge disappointment so far. Sanchez is the new Rooney. He's finished. I always forget Sanchez plays for United. This guy is finished ? ?